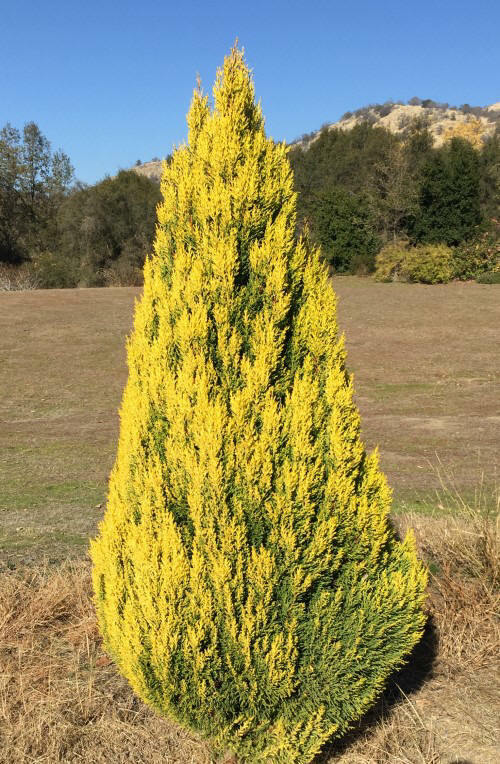 Goldcrest Lemon Cypress is a type of Monterey Cypress. It really packs on the lemon both in scent and color. The yellow leaves become more green as the season progresses but always maintain a slight chartreuse tint and yellow again with cooler weather. The picture on the left shows a five year old plant. It is about eight feet tall and four feet wide at the its widest point. Our three-inch pots of Goldcrest Lemon Cypress can be planted in one gallon pots in early spring for use over the holidays. Just add few festive touches and use to line pathways or group together on the porch. The three-inch pot can also be slipped into a decorative container and used as a place marker. When they have outgrown their container, use them to line your driveway or edge your garden.